When I reached the podium, after the applause had faded, the first words out of my mouth were, “I did not expect to win.” Yet, there I was standing before a roomful of amazingly talented people accepting an NAACP Image Award for best debut author for my novel Forty Acres. Not only was the win a surprise, the nomination was a surprise as well. Many people might not know this but in order to be nominated for an Image Award your material has to be submitted to the committee along with a submission fee. Pamela Samuels Young a friend and fellow author, and winner of the same award last year, kept urging me to submit my book, but I kept forgetting. When I finally did remember the submission deadline had passed. Imagine my surprise when on December 9th 2014 I received an email from Pamela stating, “congratulations on your Image Award nomination.” I was blown away. Apparently my publisher had submitted my novel, and for that I am forever thankful. Since I was a teenager I have been in pursuit of a dream to be a Hollywood director. That dream got sidetracked when I stumbled into a career as a screenwriter, but I ve never taken my eyes off my ultimate goal. Every year I would watch the award shows dreaming that someday I too would be able to claim a statue for some cinematic achievement. Well, life sometimes takes interesting turns. The only reason I wrote Forty Acres as a novel is because I couldn t sell it as a screenplay. I loved the idea too much to put it down so I decided to take a chance and write a book. At the time I made this decision, self-publishing was sky rocketing, so I figured if I couldn t sell it to a publisher, I’d publish it myself. Well, it did sell to a publisher, and 18 months later I’m in Pasadena in a rented tuxedo walking the red carpet at the Image Awards. Never in a million years did I dream that instead of reaching the podium for directing or screenwriting, I would instead be honored as a novelist. 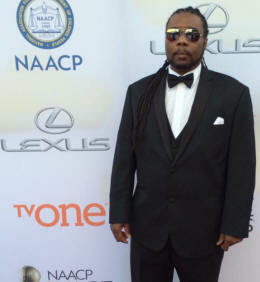 My journey into the publishing world has been amazing and after winning the NAACP Image Award, even more so. My favorite part is connecting with readers. I love receiving emails from readers and meeting with book clubs from all parts of the country. For a writer, these sorts of interactions are rewarding and fulfilling beyond description. I never expected to win the Image Award, but I’m damn glad I did.